The EASIEST way to increase Win Rates! It is directly installed in Word, there is no additional software needed. As such, the learning curve is not that extreme, as you are using Word. Support – the team at Expedience are the embodiment of excellent client service, they really do go above and beyond to ensure that all your needs at met. I cannot praise them highly enough. Style Palette – I really loved this element of the Expedience software. Styles get so little said about them, however, Style Palette makes the formatting of a document so much easier and saves you so much time in the process. In our assessment of RFP software, we found that some of the software out there is too feature rich, too powerful if you want and you end up paying for features that you do not use. Expedience helps streamline our RFP process, ultimately making the process more efficient and scalable. The ability to enter information that can be used in RFP’s and presentations that will be consistent and precise and in efficient manner to a team of people nationwide. Integration with Microsoft Word – The software simply installs a ribbon at the top of Microsoft Word, so you don’t need to switch between windows or programs and use is very intuitive for those who already know how to use Word. Excellent Support – Our questions are always answered in a timely and thorough way. They are great at actually listening to their clients, making them feel valued, and taking their feedback into consideration when further developing the product. Flexibility – Because of how the software is designed, there is great flexibility for you to decide how you want your content to look and function. Style Palette – Love that the formatting/style components are integrated directly into Word. It makes it very easy to create a corporate style with approved fonts, colors, etc. This also makes it easy to apply the styles to any document you are working on that does not have it already. And it is extremely easy to change your corporate styling in the future… Just update the style palette and the new fonts, colors, etc. are automatically applied. We researched 8 major RFP software products before choosing Expedience. We needed a product that would allow us to find and paste completely formatted answers in to Word documents, and to format new content from SMEs quickly according to our company style. Expedience does these things easily, and it’s fun to use. We were excited to get going with it, and it is now a critical tool for us. Value for money, without comprising quality. As a diverse team spread across a number of countries and offices, we needed a solution that was not only easy to use, but easy to manage. Coming from one of the market leaders, we have found Expedience has changed our experience of content management. The most impressive thing is the speed and consistency compared to our previous solution. So fun to use! I love this product. It reminds me of the old Pragmatech products that were so popular. By far easier to use than the big cloud-based products. I like that they are in Word so you don’t have to log into anything to access so I can work anywhere without an Internet connection. Very pleased with Expedience Software solutions! As a boutique firm with limited resources, we were interested in finding a simple, Word-based RFP solution to not only house our responses, but also incorporate `on-the-spot’ changes as feedback was received. We also wanted a system that could generate a comprehensive report for semi-annual compliance review. It is a fun, easy-to-use tool for preparing RFPs and questionnaires. Rather than digging through old RFPs and searching for appropriate answers, we now have a comprehensive database that is easy to maintain. We are also much more efficient in generating consistent messaging. Prior to Expedience, we were using a cloud-based tool that required a lot of ongoing maintenance and was extremely inefficient. Expedience definitely puts the client first. By creating a content library within the simple familiar interface of Word®, Lexicon can now ensure consistency in both messaging and content while simultaneously improving RFP response turnaround time. Transitioning to the new system and using is as easy as saving the file to your computer and opening the document in Word. Bamm! It’s just there and it works… like electricity. I don’t care how it works. I’m just happy and amazed when I turn on the light switch there’s light and that’s exactly how I feel about Expedience! Expedience is always quick to respond to any question or email and they make you feel like a valued member of their team. We have shaved off at least 20% of the time it took for projects no longer having to open the database and go through the tedious search and then copy and paste the answer where needed. We got hit last week with 2 very quick turnaround RFPs, a potential hurricane hitting Jacksonville, I lost power for part of the Friday workday, they closed our headquarters office – but you know what? The bids got done! In the past, we really struggled with making sure we had the latest and greatest answers and frankly, we had some issues! Now – we just check the date and we are ready to go! If you are looking for RFP request for proposal software that streamlines this otherwise tedious, time-consuming process, then you have come to the right place. 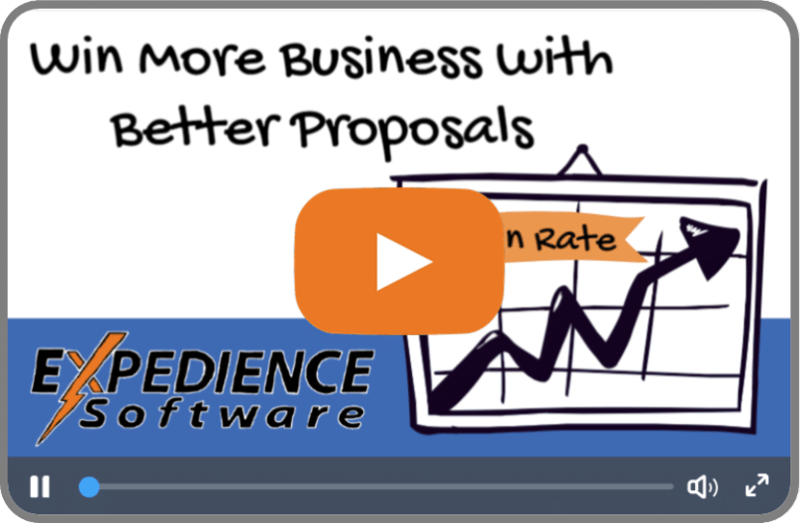 The dedicated staff here at Expedience Software has created a digital solution that makes it quick and easy to compile and format all types of proposals and documents, so your company can enhance its win rate and acquire more business. Expedience Software offers RFP automation software that it is natively incorporated within Microsoft Office. When using Expedience RFP software for Microsoft Office your team can operate within the familiar confines of Word, PowerPoint and Excel (yes we can tackle even the most difficult Excel RFPs!) while utilizing the powerful capabilities of Expedience. This means a smaller learning curve and far less training — many new users become proficient with our RFP proposal software in no time. Our clients tell us it is fun to use! With our RFP request for proposal software, virtually anyone on your team has the power and capability to create professional looking, accurate and comprehensive proposals and documents. The following are just a few of the powerful tools that make Expedience so effective. Our RFP automation software gives you instant access to approved, formatted data that you can simply drop into your proposals. That means you don’t have to dig through old documents to find that one “winning answer” or piece of data — you can store and recall it through our content portfolio. Formatting proposals in a way that makes them readable and in line with your brand is essential. Expedience provides quick and easy ways to format these documents so that they stand out from the rest. It also helps you establish consistency with all proposals and documents that leave your office. On top of the powerful tools available through our software, the Expedience team stands behind our solutions and we work closely with our clients. We provide consultations that will probe your current RFP and proposal processes and show you ways in which you can best leverage Expedience in your day-to-day operations. The bottom line is that our RFP request for proposal software makes it possible to create better proposals faster — and, instead of getting lost in the administrative minutia of the business, your team members can focus more on delivering the services that set your company apart from the rest. Talk to our team and arrange for a free demo of Expedience.